Banana bread has a bit of a bad rep because of all the bad banana bread out there. I prefer to call my version banana loaf cake, to differentiate it from all those dry banana breads that have too much sugar and not enough banana. Not everyone likes nuts, so feel free to leave them out if you don't. Some people like to toast the nuts first, but I rarely take the time to do that and haven't had any complaints yet. Of course, you can spread a slice with softened butter and call it breakfast. Or top a slice with a dollop of whipped cream and call it dessert. I suppose you could even frost the loaf, or just the top of it, with a thin icing. But I guess I'm a no-frills kinda gal because I prefer just a plain, unadorned slice along with a nice cup of tea. How about you? Don't tell me you don't like bananas; I'll only tell you that even people who don't like bananas like this. But if you really really really don't like bananas, try my chocolate loaf cake! Frugal types like banana cake/bread because it's a great way to use up really overripe bananas instead of throwing them out. In fact, the more overripe, the better. If you can, wait until the bananas are thoroughly disgusting before making this. 1 Preheat oven to 350F/180C/Gas4. Grease, butter or spray a 9x5x3-inch or 9x4x4-inch loaf tin. In small bowl, whisk together flour, baking soda and salt. Stir in chopped walnuts. 3 In measuring cup, put 2 teaspoons fresh lemon juice, add milk to make 2/3 cup; stir gently and let stand for 5 minutes. 4 In large bowl, cream butter and brown sugar together until light and fluffy. Beat in eggs, then vanilla and mashed bananas. Add dry ingredients and lemon-thickened milk alternately to wet ingredients, and stir just until combined. Scrape into prepared loaf tin; smooth top. 5 Bake for 65 to 75 minutes, or until toothpick inserted in center comes out clean. Cool in pan on wire rack for 10 minutes. Remove from pan and continue cooling on wire rack for an hour. Sounds and looks delicious, Jean. 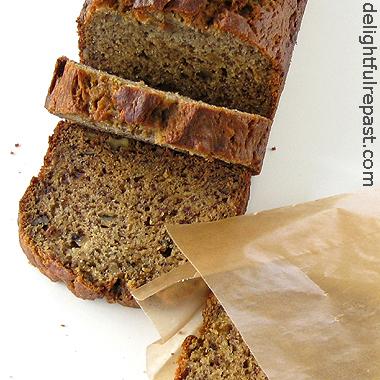 There is no reason for banana bread to be anything other than deeply banana-ish and delicious and moist! Love the addition of walnuts. I always put them in. And also I think having those bananas really ripe makes such a difference. Some people throw away black bananas. And some of us make a banana loaf out of them. :-) Beautiful photo, as usual. Thanks, Judy! I just love my "free range" wax paper sandwich bags. (My husband calls *every*thing "free range" if it is unbleached or organic or whatever! Mmmmmm, this looks delicious! I haven't made banana bread in a long time. I like mine slightly toasted with butter. It's the best! Sometimes when I buy bananas for cooking, I let them get black and then I pop them into the freezer where they stay until I'm ready to cook with them. They even come with their own wrapping! Sully, you may not be the first person to forswear travel so as not to miss any of my posts, but you are the first to mention it. I implore you to go ahead and travel; just be sure to take advantage of modern technology and read my blog while you are away from your home computer. :D But FYI, I don't let the bananas turn black, just speckled. Thanks, Richard! I've never actually let my bananas turn black. I just wait until they're very heavily speckled. It IS wonderful that they come ready-wrapped for freezing! I love love love banana bread. Dont like bananas however, although I think it has to do with the texture. Wasnt thrilled to death the gluten free version I made...still working the kinks out of that. My husband-with-texture-issues is not a fan of bananas either, though he loves them in baked things. Isn't it fun "working the kinks out" of a recipe! Thanks so much, Sandie. And all the best to you and yours! I totally agree with everything you said about the banana bread. Moist, not too sweet, and unadorned. Also the lime sherbet looks so refreshing. I have never had an ice cream maker but since my birthday is in July I may just request one this year. I can't remember the last time I had banana bread - maybe it's because I rarely keep extra bananas in the house. I tend to buy just one when I need it for something (like breakfast)... But, this bread does sound delicious and I love that you used brown sugar instead of granulated. Thanks, Javelin! What I like about it is it has more bananas than most recipes, so it has really good banana flavor. If you've been making it for 25 years, you must have started making it when you were 2! :D Let me know how you like it! I knew I liked you =D Haha, actually I've been married for 25 years. And now that I'm thinking on it, I can't pinpoint where I got the recipe we've been enjoying for so long. Anyway, I made your recipe today and I like it a lot. I can't wait for someone to come home and try it. There were many differences - your recipe has milk, lemon juice, brown sugar and butter, whereas mine has none of those things. I will be interested to see if anyone realizes it's not the usual. Cool! I love comparisons - it's interesting to see who picks up on various differences. I think the lemon really enhances the banana flavor. I hope someone gets home soon to try it!